At the heart of the Thermëa site, discover Fläm, a cottage-style rest area that is one of our guests’ favourites. Covered and built from round wood, it’s the perfect place to relax in all four seasons. Wrap yourself in your robe, curl up comfortably on a chair, and let yourself rock like a baby. Fläm is the place to relax in a cozy and comfortable atmosphere. You can enjoy a glass of your favourite drink and have quiet conversations in Fläm? A fantastic spot for relaxation, any time of the year, in a warm atmosphere. The Relaxa relaxation chalet is located behind the Fläm building. 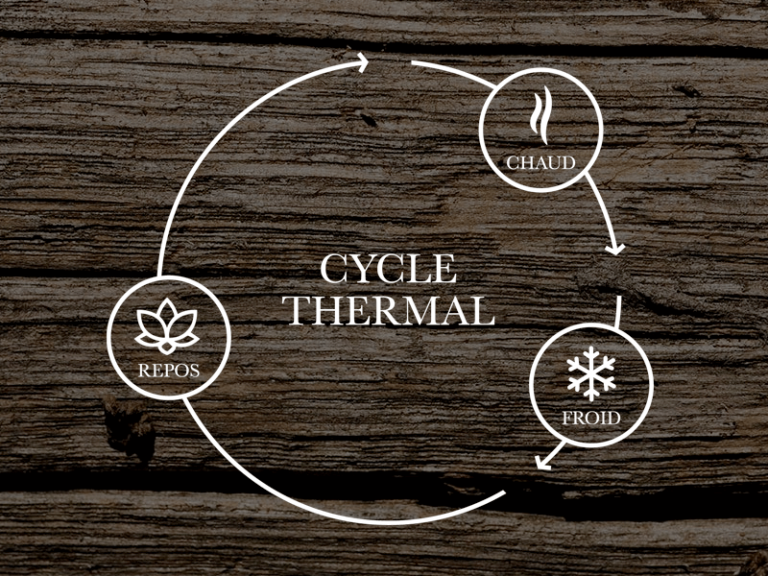 Stop by the tea station first to prepare a hot drink to your taste or pour yourself a glass of infused water, the flavours of which vary day by day depending on the chef’s inspirations. 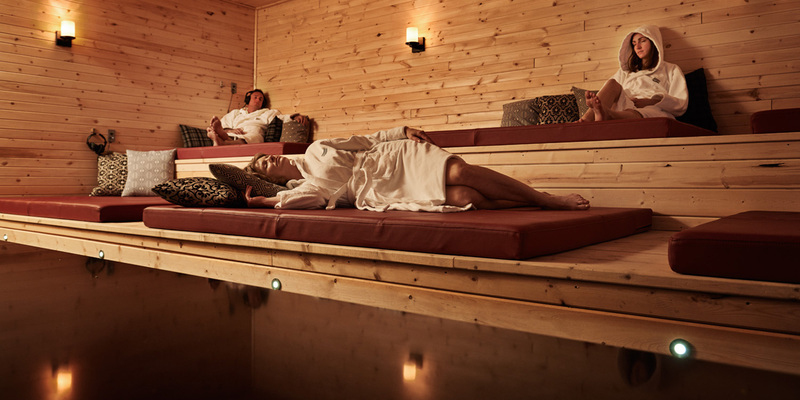 There are a variety of relaxation options in the chalet. 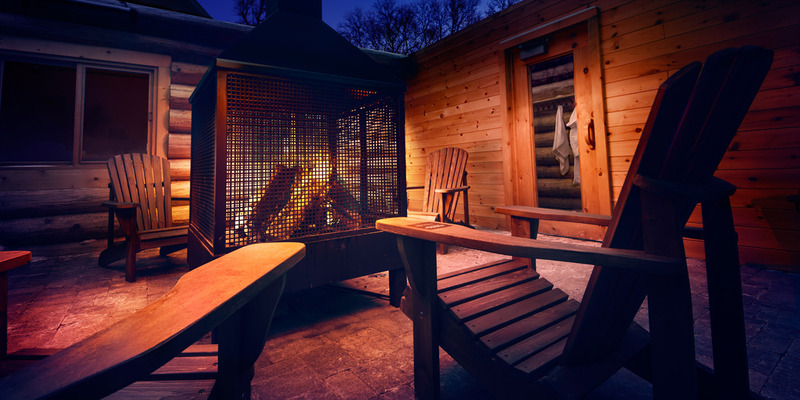 Head for the heated benches that look out over the site and the surrounding natural beauty or curl up in front of a fire almost like you’re at the cottage. Do you feel like nodding off? Head to Tellura. Restful beds and a heating apparatus welcome you to the tune of gentle and inspiring music. The room is pleasant, the lights soft, and the atmosphere designed for ultimate meditation! Close your eyes and nap — it’s allowed and even encouraged! Hedonïa is the perfect place to enjoy a little relaxation time with your friends. 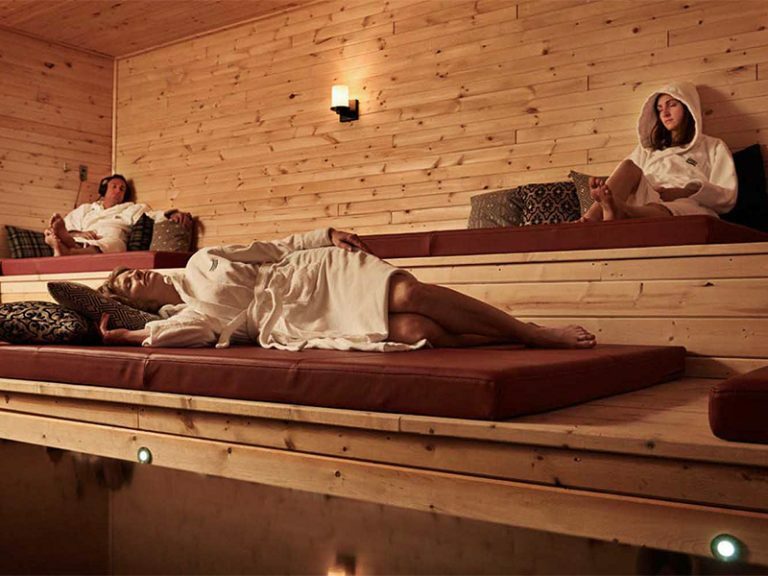 It’s adjacent to the Restö and is specially set up for social gatherings at the spa. Here, you can talk and discuss freely with your friends without worrying about disturbing other guests. 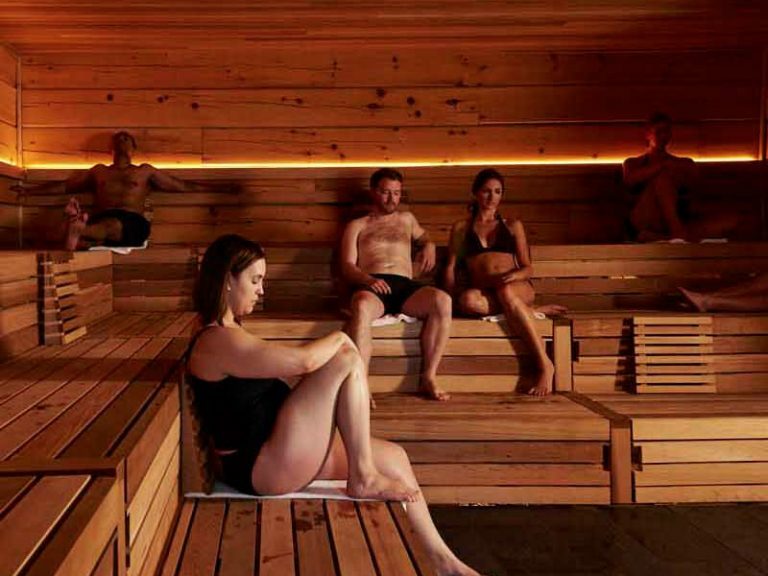 Group relaxation is a dream made reality in the Hedonïa area. 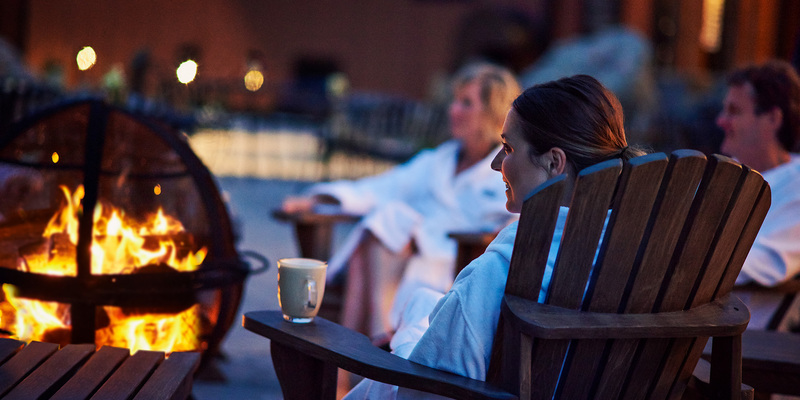 Experience an extraordinary moment of solo relaxation at the spa when it gets colder outside. Heated hammocks are available next to the Finlandia sauna. Huddled into your cocoon and sheltered from the cold, give in to the temptation and nap! Nothing else exists around you, not even the cold. The profound sense of relaxation and comfort is almost indescribable. 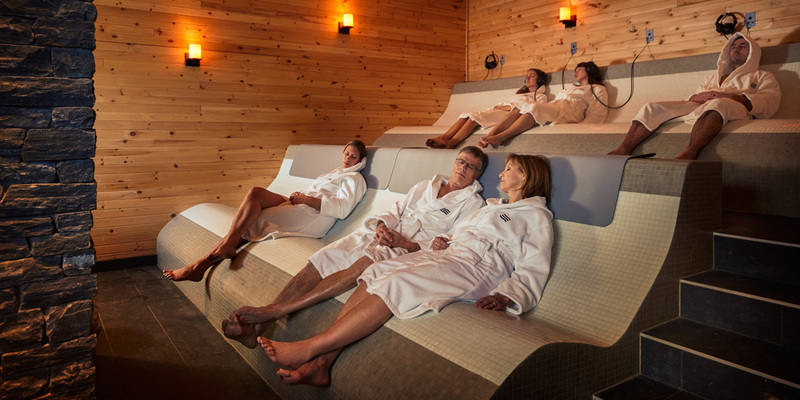 After completing the thermal cycle, extend the pleasure of relaxing solo, as a couple, or with friends, slide into Gëser. It’s complete and utter joy! 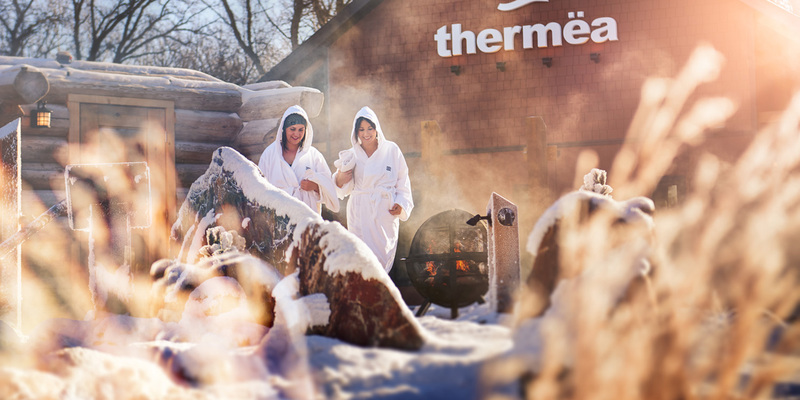 Facing the Restö, Gëser is the warmest pool at Thermëa! Its temperature is 39 °C. No matter the season, you’ll feel time stop. The water jets massage your muscles and relieve you of your daily tensions for greater happiness and well-being. In the evening, the pool is lit for an even more sublime experience.